We Think You Would Be a Great Fit! "Peter and his team are first class. Always considerate, helpful and above all honest in dealing with their customers. Thanks Peter." Great local owned company and affordable! They were very honest and took the time to explain the problem. They were able to replace all of my duct work and ac unit very quickly with above and beyond professional install. They were there on time. I have also had them repair my pool heater in the past. I will definitely continue to use them for all of my heating and ac needs! Tony and Peter do such amazing work. They installed our new HVAC system a year ago and now to scheduled maintenance checks. They are very thorough, hard working, and reasonably priced. Our HVAC system is flawless. One of the best companies we have encountered since moving to Florida this past year. We highly recommend them. Very professional and honest service, with fair pricing. Highly recommend. Top notch products and service!!! The best service, wonderful and considerate service technicians. Highly recommend to all who are searching for a reputable company. Fast and efficient. Great staff. Showed up on time and got the job done quickly. Will use them again anytime. They were totally upfront and explained exactly what needed to be done along what may need done in the future. Our tech Ray answered all our questions and was wonderful to work with!! We are so glad to working with them. They are very efficient , really know their business, highly reliable and reasonable. They are professional and take the time to explain the situation and do things right. I was very pleased with coast to coast, wish I'd known them before, I would certainly recommend them to friends and family. They were very professional, very polite and clean and tidy.Thank You Guys. Coast to Coast services our A/C and has been so easy to do business with for scheduling , competitive pricing and quality work. Javier was the tech who visited us last week, he was on time, courteous, and thorough. So nice to do business with a company like this one. I find Coast to Coast Heating & Air does an excellent job of keeping my conditioners clean and running properly. I do Recommend them and have used them for several years. Raymond has always done the work and does an excellent job. We are all very lucky to have an honest knowledgeable air conditioner service in Florida. We are now using them for five years and are very satisfied with their service. Raymond has been here many times because we always ask for him. He is very thorough and explains any important things I want to know about. 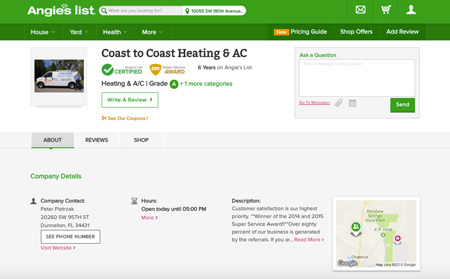 I wouldn't use any other company, and recommend Coast To Coast Heating & Air LLC to anyone looking for a company that is reliable, and professional, . Absolutely phenomenal customer service. Bright professional techs to install and very respectful of our property. Peter spearheads his team and is always available for questions. I met his beautiful wife and son today for a chat when I stopped by the office. The entire Coast to Coast Family is awesome. 😘. One of the best A/C companies I have ever worked with. On time every time.Very fair and competitive pricing, with outstanding service. We have been experiencing the professionalism and friendliness of the employees of Coast to Coast for years. They have serviced our 15 year old air conditioner and installed our new one in 2016 and still continue the scheduled maintenance. It is a pleasure to do business with such honest, high quality and professional people. I highly recommend this company. This is a professional company, yet retain a friendly and informative persona. Questions are always answered so the customer can understand. They are prompt when called. Would give this company 5 stars!! Peter and his crew are very knowledgeable & trustworthy workers. I have used Coast to Coast for years and I trust them entirely in my home and I know the job will get done right. Best AC service I’ve ever experienced. Kurt the technician was professional and very thorough and went above and beyond in making sure the unit was running properly. Have had a few companies preform service but none have provided the level of service as Coast to Coast! A friend recommended to me what amounts to be the best AC company I’ve ever had! Excellent service, professional and honest, just the way it should be. Great work! Coast to coast has serviced my ac/heating unit for the past 9 years. Have always been been satisfied. the usually respond that day or the next day. I would recommend this company to anyone. Our air kept shutting off. It was 4:55 Fri before the holiday weekend. We are new to the area didn't know who to call. By chance we called Coast to Coast, Peter said he had a technician in the field & would have him stop by. Kurt got us up & running . They both were very professional. I would highly recommend Coast to Coast. On Tuesday, July 3, we had a new Trane A/C system installed, replacing our 24 year old Trane system. Josh and Tony from Coast to Coast came out and worked all day in our very hot garage and managed to be very courteous and professional. They answered all our questions and we know that we will be well taken care of in the future if any problems arise. 5 STARS! Ray was great. On time and thorough!! I called Coast to Coast at 3 pm on the Friday before Memorial Day weekend. They were at my home in 30 minutes and had me up and running in no time. The price was very fair and the customer service was great. I’ll definitely be using them from now on for my A/C needs! Peter and the crew from Coast to Coast just installed a new air conditioning unit for us. They got our old system working over the weekend until they could replace the unit. It's nice to do business with a company that does a great job and are honest and friendly. Peter and crew are very reliable and friendly. If there is a problem Peter responds quickly and fixes it. He installed a Trane system six years ago and we are still very happy with it and their service! I recommend him all the time. Honest and reliable. They are fast to respond and friendly. Peter and his crew are the BEST! They are professional, dedicated and work on any problem until it's resolved. I also think they give fair estimates and the quality of their work is excellent. I recommend them to everyone because they also have a great maintenance program! Peter & his crew were fantastic. They were prompt & thorough. From inspecting the units we had & educating us on thier different statuses, to installation of the new unit we purchased from them. Would recommend for sure to anyone in Dunnellon or surrounding areas! Thanks so much for the professional, efficient & clean work you did! We have used coast to coast heating and air since we bought our house three years ago. They are reliable and provide excellent service. Thank you. Can’t say enough about Coast to Coast. Peter & his crew has been servicing my system for years. I remember when Peter just started out & did everything himself. His company is growing because of his honesty, reliability, dependability and professionalism. Thank you Peter and staff! Have had our maintenance done with this company for the past three or four years. Today Josh, a new Tech, was sent. He was very knowledgeable and professional. 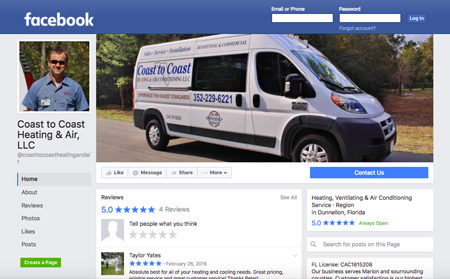 In our opinion, Coast to Coast is the go-to company for your Heating and Air Conditioning service. I appreciate the reliable, consistent and excellent service Coast to Coast Heating and Air LLC has provided through the years to my mother and to me. Thank you. A couple years ago our heating & air conditioning unit died. A friend recommended Coast to Coast Heating & Air, so we called them. It was the height of the Summer! Peter and his crew came right out. They were concerned for our well being and made our unit live again while we waited the short time it took to get the new unit installed. We feel everyone should start the New Year off right by calling Coast to Coast Heating & Air to service your climate control needs. We strongly suggest you get their Service Contract, then Peter calls to set up an appointment for Ray to come to your home to service your unit. This is done on a regular basis and believe me Ray checks EVERYTHING ! In all honesty, we must say, the new unit installed by Coast to Coast Heating & Air has reduced our electric bill by $100.00 per month. Honest, reliable and great customer service with the most reasonable prices I have seen in Florida in my 14 years as a resident. When I needed a new air conditioner unit they had to build a new platform in the garage for the air handler. It was so beautifully done, it beat what the original builder had installed. I have a yearly contract and they contact me twice a year to service my equipment. I highly recommend this company. You will not be disappointed. Thanks to Peter and DJ for a super professional job replacing our heat pump, air handler and thermostat with new highly efficient Trane equipment. Peter is easy to work with, dependable, knowledgeable and skilled in his craft. 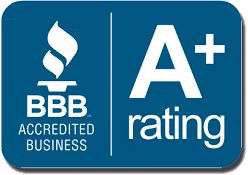 If you are looking for someone to trust your heating and cooling system care or replacement, calling Coast TO Coast will be the best decision you will ever make in our opinion. Peter and the Coast to Coast crew did an outstanding job of installing our Trane 5-Ton HVAC unit several years ago and continue to do a superb job of maintaining it on a regular basis. I recommend them highly and will continue to recommend to friend and neighbors.P.S. for Peter; Sto Lat! did an excellent job of installing our Trane 5-Ton HVAC unit several years ago and continue to do a superb job of servicing the unit on a regular basis. Absolutely the very best,I have a contract with them whereby they come out twice yearly and do a check on the A/C. Have been with them with quite a few years. Peter and Ray are always top notch in customer service. Peter, the owner, will bend over backwards to find a solution to the problem. They are honest and don't try to find problems that do not exist. Cannot say enough good about them. I highly recommend them and will definitely go to them when it is time for a new unit. This has got to be one of the best companies in the Ocala area. I could not say enough nice things about Coast to Coast! They are friendly, professional, knowledgeable thorough! Service from this company was absolutely excellent... They left a job just to come to get the AC fixed because my elderly mom was in the home! Peter and crew installed a new Carrier A/C unit and did an excellent job, very happy with their work, system operates great. This is really an excellent company! They arrive when they say they will, are always very professional in appearance, and actually can determine what, if any, problems you might have - and fix it immediately. We have had a service contract with Peter since 2007 , and it is the best money we have ever spent. We have heard horror stories from friends who have used other companies, and I would not hesitate to recommend Coast to Coast to anyone. Curt was courteous, knowledgable and I believe honest! They came out within a few hours of my phone call and diagnosed, fixed the problem. I'm happy and I highly recommend coast to coast heating and air. This is an honest contractor. If your unit can be repaired, they repair it. They do not try to sell you a new unit which would make them more money. I worked for an AC company before and know how much they make on new units. So I appreciate their honesty. Superb customer service, always quality work and prompt on repairs! I would recommend them to anyone. Thank you for everything Coast to Coast! So thankful for the level of courtesy and professionalism that Coast to Coast has given. They did an amazing job replacing our A/C and their prices could not be beat! They were quick to get everything done with a level of expertise and skill. I would highly recommend this company to all!!! Absolute best for all of your heating and cooling needs. Great pricing, reliable service and great customer service! Thanks Peter!